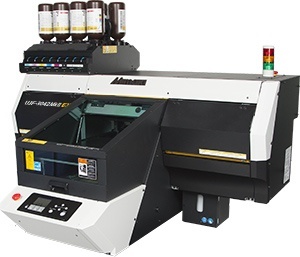 UJF-3042MkII EX | Product | MIMAKI SINGAPORE PTE. 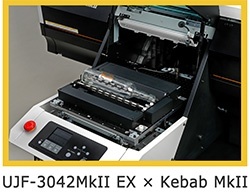 LTD.
"UJF-3042MkII EX" is the EXTRA model of " UJF-3042MkII", of which high productivity, excellent machine performance and beauty of print are reserved to upgrade the configuration from the 3 print heads to 4. A compact but great UV-LED inkjet printer of A3 size, "UJF-3042MkII EX" realizes the high value added print. UJF-3042MkII EX enables an additional attachment of white, clear and primer ink with the full color (CMYK). Max. 2 bottles of white ink can be attached to the printer to realize the high density white print in a short time with more opacity. The optional items of UJF-3042MkII will be equipped with UJF-3042MkII EX as the standard accessories!